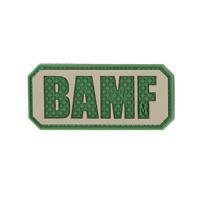 Let everyone know not to mess with you with the "BAMF" Morale Patch from Maxpedition. Colored in bold and high-contrast green, it is finely detailed and shaped for an eye-catching, three-dimensional appearance. The patch is made from durable, flexible PVC rubber, perfect for use in harsh outdoor field conditions. Its hook-back attaches to any loop surface, such as the ones found on many tactical bags and gear. It also comes with a separate loop sheet that can be sewn onto uniforms or other accessories for more permanent attachment, or can serve to protect the patch's hooks when not in use.